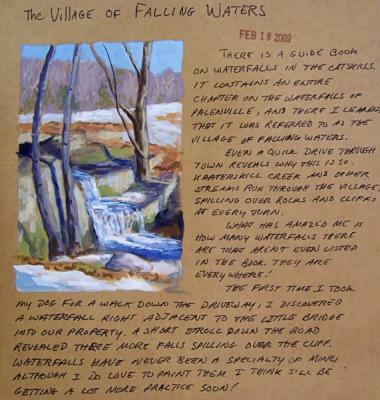 Kaaterskill Clove was one of the favorite painting locations for many of the Hudson River School artists. Thomas Cole, Frederic Church, Jasper Cropsey and many others painted these mountains in centuries past. It’s easy to see why they were drawn to this dramatic location. 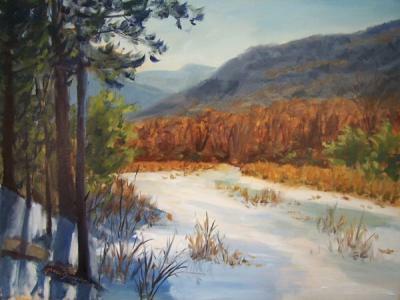 The Hudson River provided easy access upstate from New York City and the Lower Hudson Valley. The mountains are only 10 miles inland from the river. Here’s how I set up to paint from the computer for works larger than 8×10″. I prefer this to using printed photos. 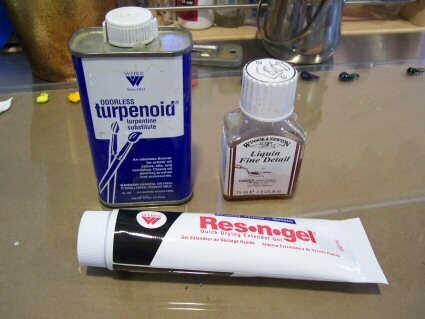 These are the mediums I planned to use for the painting. It’s the first time I tried the Weber Res-n-gel, but it didn’t tack up as quickly as I’d hoped. I think I prefer just turp, or turp and a tiny bit of Liquin for the underlayers. 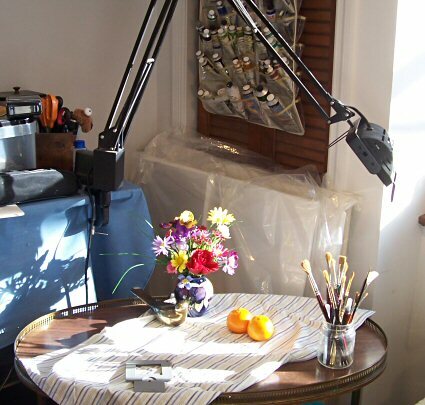 I use a glass palette in the studio with a sheet of brown kraft paper below it. It is so easy to clean. I had a glass store cut this 16×24 piece of 1/4″ glass for me and grind the edges. I hope you enjoyed seeing some of the steps and materials used along the way. 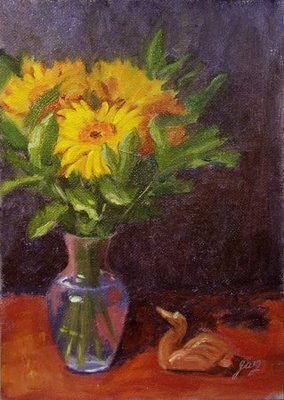 This gorgeous bouquet of gerbera daisies is paired with a little bird sculpture that hangs around my studio and enjoys making an appearance in still life paintings from time to time. 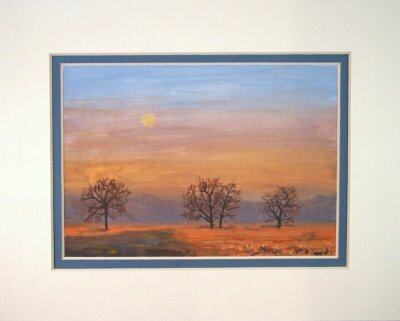 5 x 7″ beautifully double matted to 8×10″, Gouache on Fabriano Artistico 100% rag paper. Painting with mat will fit into a standard 8×10″ frame, or without the mat in a 5×7″ frame. Price includes double mat. Many thanks to Connie van Winssen for use of a photo reference for this painting from her villiage of Westbroek in The Netherlands. I don’t generally paint from photos other than my own, but I was so captivated by the colors and mood of this scene that I just had to paint it! 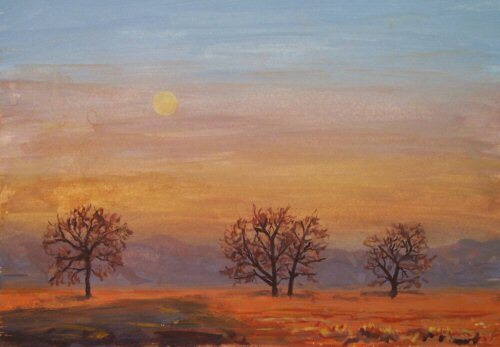 I selected a warm, limited palette of colors: Yellow deep, Venetian red, Ultramarine blue, and white to bring out the rich warmth and glow of the scene. 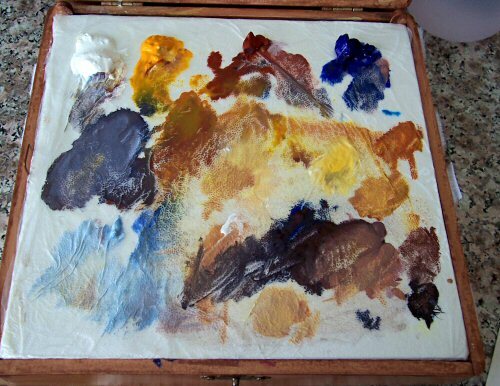 Below, you can see what my palette ended up looking like when I was finished! 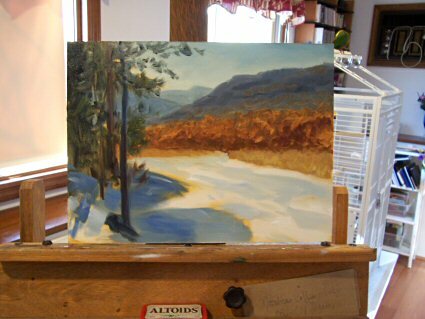 I did wipe it off once during the painting process, after laying in the initial colors. When a palette gets too muddy, that mud starts making its way into the painting. The trees behind my house light up bright orange beside Peach Lake Brook for about 15 minutes before sunset, reflecting strongly in the water, with the rest of the scene in shadow. I’ve been wanting to paint this view at this time of day forever! The strong color is fleeting, so this one was painted from a photo. Whew, was this ever hard! I thought it would never get finished. Sometimes these little ones can take as long as a much larger painting to complete. This one certainly fell into that category, but I am pleased with the result. 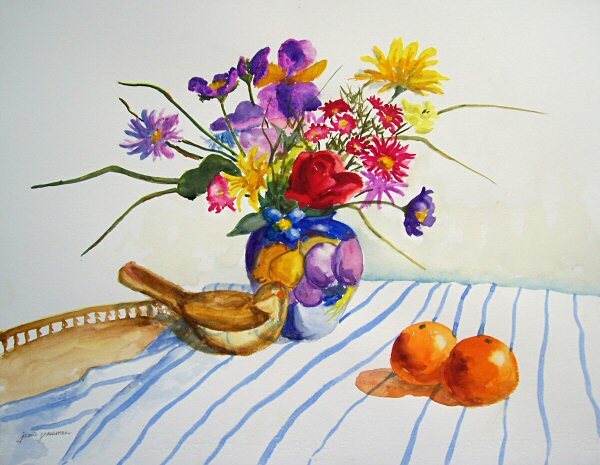 The vibrant colors of this painting make me feel happy! 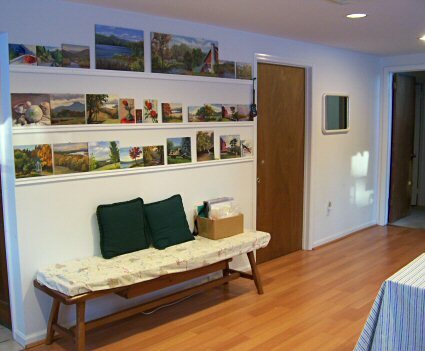 This is a fairly large watercolor painting at 16×20″, and I wish I could get the whites to be that bright white color in the photo, like they are in the painting! It’s a good thing I’m a painter and not a photographer. This was a lot of fun…and a lot of work! 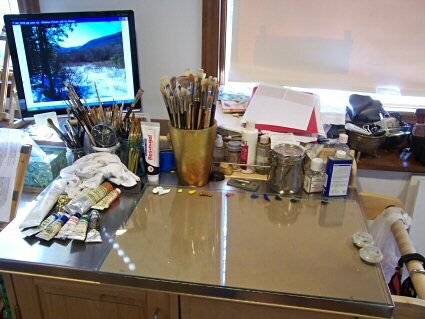 Studio Tour—-Getting ready to get ready to paint…. Sometimes I just can’t seem to get ready to paint. I use so many different mediums, and paint such diverse subjects, that my studio is forever littered with acrylics, gouache, watercolor palettes, sketchbooks lying around, canvases stacked up against the walls, still life objects lining the window ledges, and dirty water containers, not to mention all the things that end up in my studio that don’t even belong here! I woke up this morning thinking about starting a large painting. When I got to my studio, I took out a 24×36″ canvas and put it on the easel. All the furniture is on wheels, so I started thinking about doing some “easy” rearranging. Hahaha! It never works out that way. I was putting things away and moving things around, and by the time that was done, it was way too late to start something big. 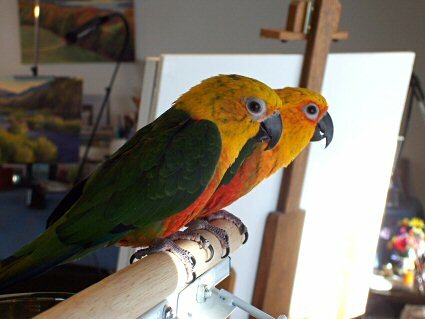 Here are my studio mascots, collectively known as Double Trouble! Even Lulu and Lucy thought I was crazed. They were very curious about the changes in their surroundings, and wondered what Mom was up to. I figured I’d set up a still life and paint in watercolors instead, since I’d lost the morning already. Even that process seemed to go on forever today. Blue cloth or striped? Two clementines or a little blue and gold box? Brass bird or horse sculpture? I finally made my decision on the still life setup, but now we were already into the afternoon. The phone started ringing. My daughter came home from school. I have a meeting this evening and had to get dinner underway. The day was slipping away. It seemed the best choice was to take some more photos to share with my viewers. 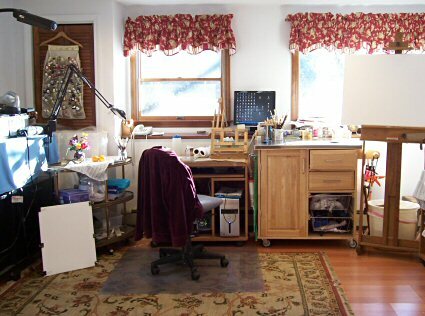 The image above shows the area where I have my computer and do many of my small paintings. If I’m not working from life, I look at the images on the computer monitor instead of printing out photos. The color is so much better, and I can zoom in as needed and make color/value adjustments. Plus, it saves all that ink and paper! My sister gave me this hanging storage device. 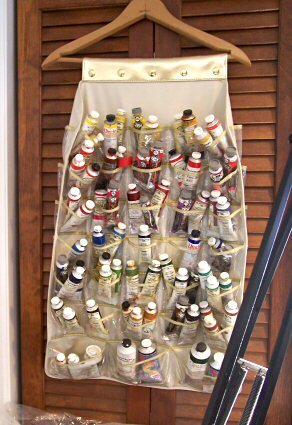 I think it was designed to hang in a closet and store jewelry, but it’s perfect for paint tubes. My most-used colors are in a box near the easel, so this holds mostly tubes of less-used oil paint colors that I need only on occasion, and keeps them easy to locate, yet out of the way. My brother-in-law built this beautiful spice cabinet. It has a glass door with a key lock. When he moved to California, he didn’t know what to do with it, so I promised to put it to good use. 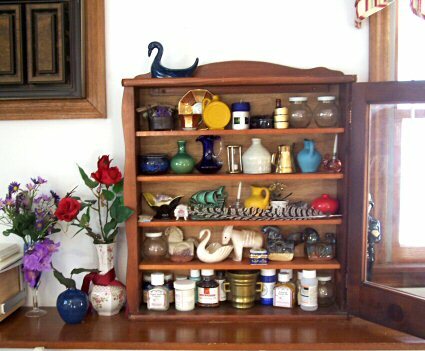 It serves as a display/storage cabinet for my small still life objects and some smaller jars of mediums and pigments. 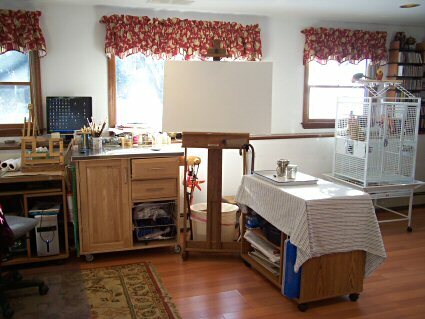 Some time ago, I made and installed these drying rails in my studio for my small paintings. 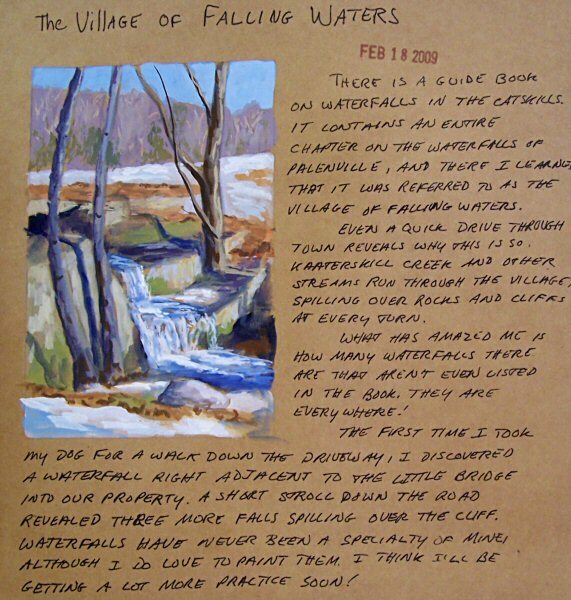 They can hold paintings up to 16×20″ in size. I bought the molding at Home Depot, painted it, and secured it into the wall. If I were to do it again, I’d add a 1×1″ strip behind it to make the shelves a little deeper, and the paintings more secure. I use a dab of blu-tack on the backs of the paintings near the top to be sure they won’t topple over, since my rails are so narrow. 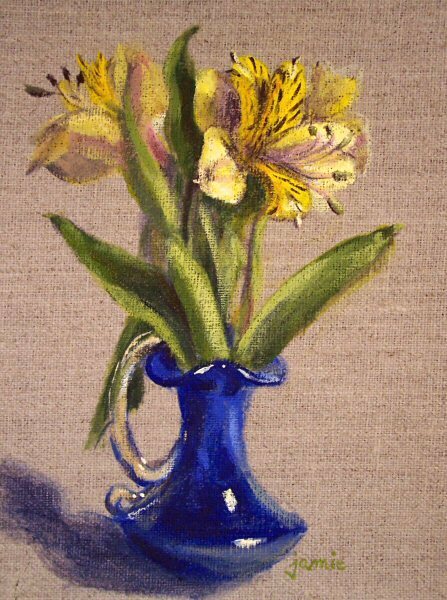 Tomorrow morning I will have that nice still life setup and my watercolors all set to go, plus a large canvas ready and waiting. At least I won’t have to clean again! Some viewers have emailed comments and questions. one or two of them. Right now my studio is too crowded to even work! You are inspiring and refreshing to see! chatter in the creative process. Marilyn, thank you for your comment. Have you ever heard that annoying sound that a crow makes? Well, imagine that fifty times louder. And imagine two of them. Then imagine it in an enclosed room with little sound absorption. That’s what Lulu and Lucy sound like when they get on a rant! They do make cute sounds too, like a gurgling sound when I give them peanuts, and a purring sound when they sit on my shoulder sometimes. They make kissing noises and say “Kiss?” when they want me to come over. 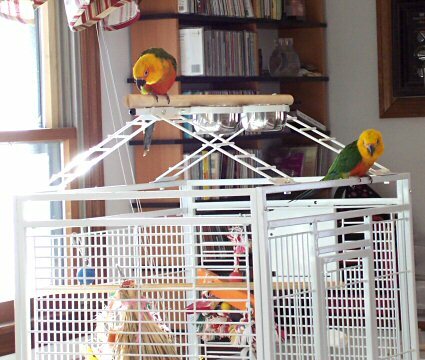 So, for anybody who’s thinking they are so cute and they should run out and get some Jenday Conures, be sure your neighbors live far away, and that you have earplugs within reach! 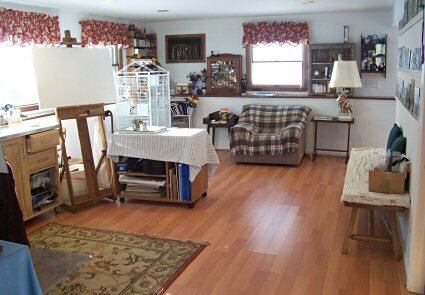 Thanks for sharing your studio. I have a couple of otherwise decent universities that say I am a sculptor. Lately I have been working on my studio. Sculpture studios never look as nice as yours, ever. Dave, I knew there was a reason why I decided to be a painter! I have to say though, mine rarely looks this neat. That’s why I had to take the pictures—so that I can remember it was once this way! 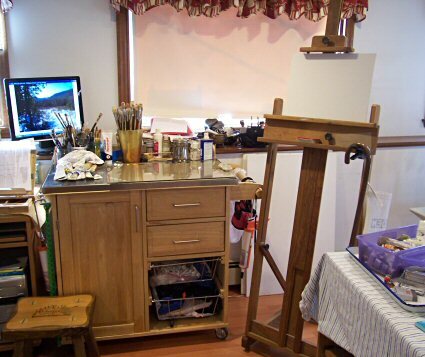 Jamie – Your studio looks great. I feel inspired. Right now I can’t walk in the room. How long did it take you? Do you keep all the mediums in separate places? Kay, it took a whole day. Yes, I do keep my mediums separate, and I keep my main colors separate from my extra colors, for the most part. I generally keep my main colors in a zip-lock bag, one for each medium. The bags are great because they take up the least amount of space, and I can just grab the bag labeled “main colors” when I’m on the run to go out painting. 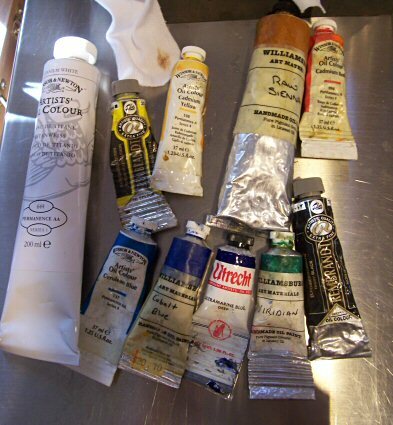 Extra oil paint tubes are stored on shelves in the garage, since they can endure cold temperatures easily. My husband came home today with a beautiful bouquet of flowers for me! 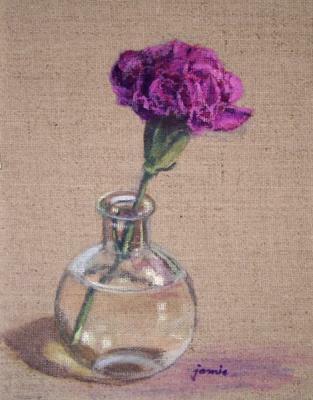 These purple carnations are so gorgeous; I had to paint one right away. The linen is clear-sized, so the beautiful color and texture remain visible. $375.00 plus $15 shipping and insurance within the Continental United States. For local sales, shipping charge will be allocated to NYS Sales Tax. Please email me at JamieWG@aol.com for International purchases or with any questions. 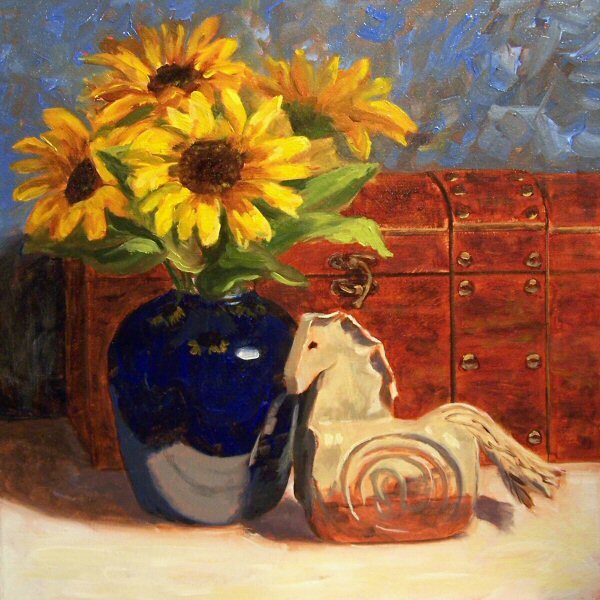 What better way to brighten up your day than with a bouquet of sunflowers, paired with one of Louise King’s unique “Mud Pony” horse sculptures? 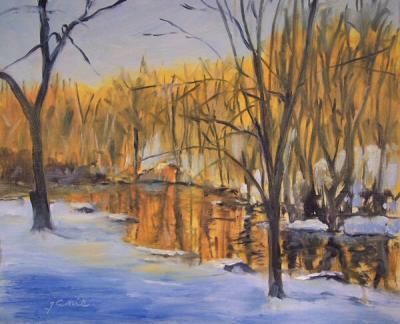 I loved doing this colorful painting, with the strong color, high contrasts, and varied textures. It’s one of my personal favorites.